Editor/Author van Oostendorp, Marc, Ewen, Colin J. and Hume, Elizabeth V., et.al. 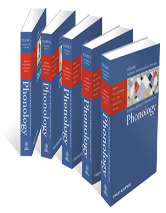 The Blackwell Companion to Phonology is a major reference work drawing together new contributions from leading international scholars in the field. It will be indispensable to students and researchers in the field for years to come. Key Features: Full explorations of all the most important ideas and key developments in the field Documents major insights into human language gathered by phonologists in past decades; highlights interdisciplinary connections, such as the social and computational sciences; and examines statistical and experimental techniques; offers an overview of theoretical positions and ongoing debates within phonology at the beginning of the twenty-first century; an extensive reference work based on the best and most recent scholarly research - ideal for advanced undergraduates through to faculty and researchers.